Being a builder is not just about putting up concrete structures, collecting money and making the balance sheets grow in figures and numbers. Rather, It is about shouldering a much larger social responsibility wherein a person's life earnings are at stake for a shelter of his dreams or a commercial base to flourish. Our organization would first like to become a better citizen of the society before becoming World's best construction company. We should also not forget about our planet, that has permitted us to live on it. Thus, our buildings should be environment friendly causing least burden on the natural resources. 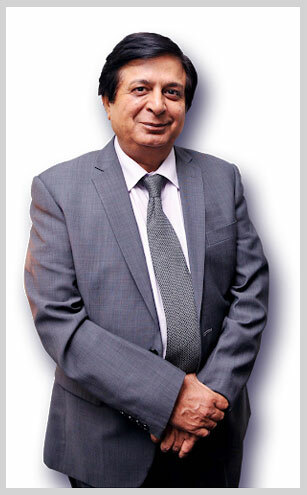 Dr. M.Yusuf Khan is Chairman of the Development Banking Advisory Council at Yes Bank Ltd. The council augments key developmental banking projects in the 'public-private partnership' area for the growth of state level socio-economic infrastructure being pursued by Yes Bank along with various state governments. Dr. Khan has had a distinguished career spanning over a decade in banking and was instrumental in the rapid growth of Jammu and Kashmir Bank during his chairmanship between 1996 and 2005. During his time as Chairman, the turnover of the bank went from a mere $890 million to $7.3 billion and the NPA came down from a double digit figure to just 1.41%. When he left, about 95% of the branches of the bank had been computerized and were offering Internet Banking facility to its customers for the first time. Between 1975 and 1996, Dr. Khan worked in senior management positions in several Government Organizations in Kashmir such as Kashmir Small Scale Industries Corporation (SICOP), J&K State Industrial Development Corporation, J&K Tourism Development Corporation and J&K Agro Industries Development Corporation. He was also appointed as a Senior Advisor at the New York-based investment group Berenson and Company in 2005 where he supervises Berenson and Company's operations in India. Dr. Khan is a nominated member of the Chattisgarh Economic Advisory; Government of India, Member of the Banking and Financial Institutions Committee of FICCI and Member of the Managing Committee of Indian Banking Association. He also serves on the Board of Directors for Bharat Hotels and Zee Telefilms. Dr. Khan received Gaurav Samman (Best Banker of the year-2001) Award from Union Home Minister L K Advani for his meritorious services in the field of Banking. He is the recipient of several prestigious awards like "Udyog Rattan" award, "Pride of India & IMM" award, for excellence as top professional manager, and "Excellence Award" by Institute of Economic Studies among several others. He is a science graduate from the University of Kashmir and has a Doctorate of Philosophy in Business Management (PHD) from Burkes University in UK.